There are two types of processors that perform different tasks, CPU (central processing unit) and GPU (graphics processing unit) computer has two types of processors. CPU - central (main) processor such as Core i3, Core i5, Core i7 from Intel or AMD FX ™ AMD Athlon ™ X4 from AMD. GPU - this graphics processor is used in Nvidia graphics cards, AMD Radeon ™, MSI. There is also a CPU processors with integrated graphics processors that have a CPU core CPU and GPU core GPU, CPU + GPU, such processors with integrated graphics called eg Intel® HD Graphics. The main difference between the CPU and GPU in tasks performed. CPU a processor whose main task is to perform various calculations and support for the programs not directly related to the withdrawal schedule, it performs sequential tasks with high computing speed. For example the conversion of data or software works the powerful software has different computational modules. GPU designed to work with graphics and in its composition has several tens or even thousands of small processors of its main task is to get the data and convert them into pixels on the screen. Such processors perform parallel tasks, receive information and convert the data into pixels (color, brightness). With many small cores that operate independently of each other, they provide very fast data conversion and output the image on the monitor screen. Micro processors produce parallel conversion one processor calculates only the pixel group for example in the left part of the screen, and the other is responsible for the pixels are in a different part of the screen, after the parallel conversion to get the picture that will be displayed on the screen. 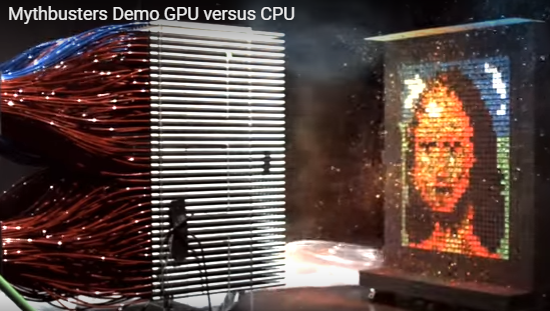 The most easy to understand, GPU processor operation is demonstrated in the video from Nvidia when the picture is drawn simultaneously shot the paint drops that simulate pixels, the picture drawn for 1 second. In practice, the present CPU and GPU work in the following way, for example in the game, CPU is responsible for handling the dynamics of the game, he will make the calculation at which point the screen should be the objects, this information is available in the graphics GPU processor, it will be processed and displayed on the screen image with objects in the desired points. Therefore, the more games will work effectively for example less powerful CPU Intel i3 and a good graphics card and much worse will work, set Intel i7 processor and graphics card is weak. This is due to the fact that the main task in the game display pictures as quickly as possible, and the calculation itself is not too much. In programs where necessary calculation speed, processing large amounts of information and the results of the static and the output on the screen, neohodimo have greater computing power. In such cases, almost no matter what the GPU is used, we need an efficient CPU. This is clearly seen in the trends of computers for office need a computer with good CPU processor, in this case Intel i7 Intel I3 much better and almost no demand graphics card with GPU processors. Therefore, office computers usually have a built-in schedule as it is not so important. For gamers on the contrary it plays the role of power GPU graphics processor, and there could not be a better experience on a separate card and ensure that the output image on the screen, it is also easier to replace, update your computer by replacing the video card. Between the CPU and GPU is no competition, the processors are designed to perform different tasks, they complement each other.